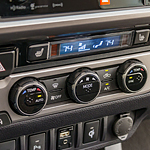 One unique feature of the new Toyota Tacoma is the Adaptive Cruise Control system. Simply choose your desired speed, and the system will utilize front-mounted sensors to locate a lead car and create an invisible buffer. That buffer is a safe driving zone, maintained automatically as your vehicle speeds up or brakes as needed to keep the distance.